You can’t go wrong using tropical fruits to make purees, juices, and concentrates and then sell them to make money. “Selling fruit juice is a profitable business because the markup is 100% to 150% and the market is big,” says Myra Rose Menor, fruit juice lecturer at the Ultima Entrepinoy Forum Center in Quezon City. “The demand never goes out and if you pick a good location, you may recover your investment in just one day.” You may supply offices and canteens or rent a stall to sell them if you have the money for it. Study your market. Understand what your customers prefer in juices, concentrates, and purees so you can give then what they want. Start-up capital is P3,000 – P5,000 for 2 packs of juices and 1,000 ml of puree. Time to finish is 1 hour. Prepare 500 ml of water, 1 cup of sugar, 1/4 teaspoon of xanthan gum (P60/60 grams), 1/8 teaspoon of sodium benzoate (P16/100g), 1/2 teaspoon of citric acid (P66/kg), and 1/8 teaspoon of flavoring (P710/liter) from chemical stores. Now mix the sugar and xanthan gum in a pan and then slowly add the water, stirring constantly to make sure the mixture is even and lump-free. Heat the mixture to 80-85° C, stirring once in a while to even the heating. Then remove the pan from the heat and add sodium benzoate and citric acid — stirring constantly until evenly mixed. 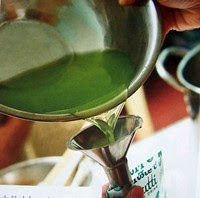 Now pour 250 ml of the mixture into the measuring cup, than add droplets of flavoring (you may use a medicine dropper). Mix the juice well and then pour into a pouch. Use a sealer to close it, making sure you remove bubbles from the juice because trapped air increases the number of pathogens in the mixture and shortens the product’s shelf life. Now immerse the product in tap water until the temperature goes down to about 40° C.
You may use fresh and ripe fruits with pulp like mangoes, apples, pineapples, and oranges. If you prefer mangoes, you’ll need 1.5 kg of the fruit and 0.05% or 0.5 gram of citric acid per kg of mangoes. Using gloves to ensure cleanliness, wash the fruits thoroughly, peel the skin, and then scrape off all the pulp. Weigh the pulp — the average weight of pulp you get from 1.5 kg of mangoes is about 900 grams — and then put it in the blender to reduce it into puree form. Now pasteurize the puree by heating it in its container for 3-5 minutes in the stove. You may add sugar to enhance the puree’s sweetness or add more mangoes if you find it too luscious. Add 0.05% citric acid (1/4 teaspoon per liter) and mix it slowly until the citric acid dissolves. Pour into a dry bottle, cool, and then label. You may also concentrate any fruit of your choice, though this is normally done to fruits without pulp like kalamansi. To start, you’ll need two cups of fresh kalamansi, 3.5 cups of sugar, 1/8 teaspoon of sodium benzoate, and 1/4 teaspoon of citric acid. You’ll also need a knife, stirrer, basin, and bottle for packaging. Wash the fruits and then cut them in half before squeezing the juice out and using a strainer to separate the seeds. Add sugar and then heat the juice at 85° C until the liquid is cooled. Pour into a bottle while still warm to kill off microorganisms, and then seal the bottle. Keep your workplace clean. You don’t want to sell beverage full of bacteria and pathogens. When selling your products, know that -18° C is the ideal temperature for storing fruit juices and extending their shelf life. Based on the above recipe, one pack of fruit juice will cost P5.50 to make. For the mango puree, the production cost is P36.70, while the kalamansi concentrate costs P57.38 per bottle. Simply add a 100% to 150% markup on each to get your selling price of P11.74, and P115 respectively.